To start, go to the “Tools” area, select the “Pages” subsection and the “Rotate” command as highlighted in the screen shot below. Right click on the button and select “Add to Quick Tools” to add the command to your toolbar. Set the Direction and Rotate options as shown in the screen shot below. Be sure to select “All” pages. 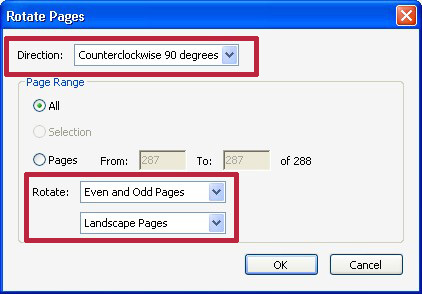 The "Rotate Pages" dialog with proper settings to rotate landscape pages. Adobe Acrobat will rotate all of the landscape pages to a portrait orientation. Save your document and submit to the Graduate School!